The Russian Oscar-class cruise missile submarines are formidable underwater predators capable of stealthy pursuit and long-range attack. The 18,000-tonne, 154 metre-long vessels are only smaller than one other Russian submarine, the Typhoon ballistic missile submarine. Designed in the 1970s to carry a complement of 130 and chase U.S. aircraft carriers at speeds up to 30 knots, the first Oscars hit the seas in the early 1980s. Russia has at least 14 Oscars, including the SSGN Kursk which was commissioned in 1995, making it one of the youngest of the fleet. Oscars are armed with 24 SSN-19 Shipwreck cruise missiles and 36 torpedos which can hit targets more than 500 kilometres away. They are also equipped to carry nuclear warheads. Because the Oscars are among the quietest submarines in the world, Russia isn't afraid sending them into foreign waters. Last year, U.S. intelligence agencies detected two Oscar submarines off the U.S. coast. The first was spotted off the Atlantic coast and the second moved from Hawaii towards the California coast and then north, observing U.S. navy vessels and bases in the Pacific. In 1997, an Oscar was seen shadowing several U.S. aircraft carriers off the coast of Washington state. The smaller British Trafalgar-class submarines have five tubes capable of firing both Spearfish and Tigerfish torpedoes. Some, including Trafalgar, can launch the Tomahawk cruise missile. The rest of the fleet should be so modified by 2006. Originally intended for hunter-killer operations against Soviet submarines, with the inclusion of the Tomahawk system, they can assist in attacking land-based targets. Thanks to their excellent optics and other sensors, they are perfect for surveillance missions. Though there have been some problems with this class of submarine (not to mention a few groundings----most embarrassing---), all 7 in the class are still operational. This super set of subs is typical of what Dragon produces. Well molded with engraved detail, these two full hulled subs are totally devoid of flash, sink marks or ejector pin marks. The same can be said for the included aircraft. In this case, it is a Nimrod MR.2 and two Sea Kings. Each comes with a small stand so they can also be displayed. Since the subs are so basic, construction is rather straight-forward with no real surprised. The small bits will need some care in removing from the sprues to prevent breakage. The instructions are well done with paints given in the Gunze line. A small decal sheet is included, providing markings for not only the submarines, but also for the three aircraft. 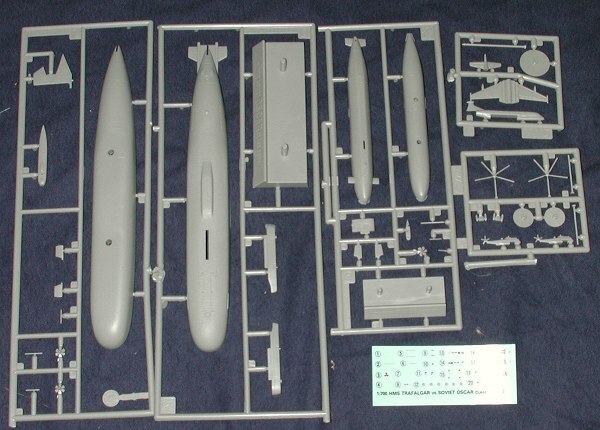 In short, this is a very nicely done kit of two very different submarines. Construction should be rather quick with only painting providing any real challenge and not much of that!